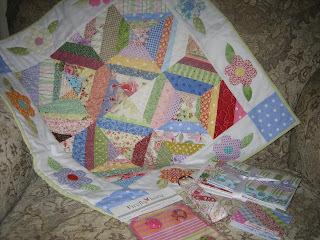 Today my 4 Seasons Spring Quilt arrived. I LOVE it! Julie made it for me, and I am just tickled pink. It is a darling little scrappy string quilt. Don't you love it? I can't wait to finish the painting in my sewing studio and get this quilt hung up with some of the others I have received! Julie was also kind enough to send me some other items that she stocks in her etsy shop. Some darling sewn note cards, a key fob, and ponytail holders with darling fabric on them! I love it all. Julie you were so generous. Thank you! I have been busy, busy, busy in the sewing, quilting, and designing departments! Andrew's teacher is retiring this year, and she is a quilter, so I thought it would be fun to make a little quilt for her signed by all the kids she has taught the last 2 years. She was supposed to be retiring next year, but her mother had a stroke, and so she was going to retire a year early so that she could care for her mother more. Her mother just passed away last week though, but she is still going to retire. It wasn't much time to get this quilt organized. I would have liked to be able to have more of her students sign it, but there wasn't time for me to go to the middle schools. You probably won't see that quilt, since it has first and last names, but it is almost finished. I have one more line of hand quilting to do, and then I will apply the binding. My current raging debate is how best to utilize this gorgeous blue fabric in a quilt (seen below). You may remember I used this line, Moda's "Swell", in a baby quilt for my dear friend Melinda. I really wanted to make a quilt for me too, and something with a great design to it, but I hate to cut up the beautiful fabric! Any ideas? The girl's are getting matching dresses from other fabrics in the line. Hopefully those will get done this weekend! 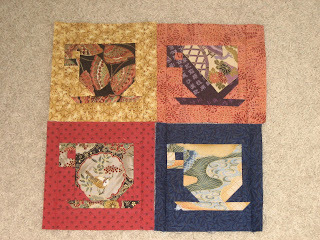 The blocks below are for the doll quilt swap on the about.com forum. The person I am making for said "anything goes", and a few days ago I was very inspired by this little tea cup quilt. I knew I wanted to make something similar for my swap quilt, and I had all these gorgeous Asian print fabrics sitting idly by in my stash. I drew up a block to paper piece the cups in EQ5, and got to work paper piecing the blocks. The final quilt will have sashing in between the blocks, and a few fabric embellishments... depending on how they turn out! 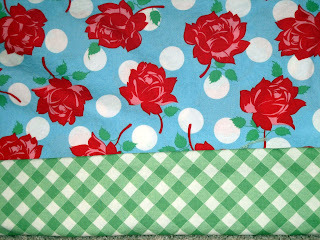 The last quilt I have in the pipeline is the summer quilt I am making for the 4 Seasons swap... The quilt I have decided to make is stretching me, but in a good way. I am going to make some blocks that are quite a bit more country than I have done before, but I am really excited about the quilt. 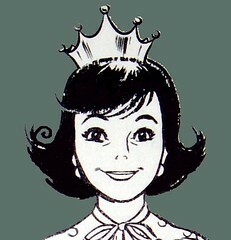 I am going to attempt hand applique! I have patterns ordered for that one, and once I finalize my design, and get to work on it, I will post some pictures! I think I like the teacups without sashing... very nice just the way it is. Maybe a pieced border, though. Looks like lots of beautiful quilts and quilting happening at your house. you kind of make me wish i was a quilter. i love seeing your projects. Wow! I wish I had your taste and your talent! I might need to send some of my projects your way - my mom has been working on a "new baby" quilt for my son who just turned 2! Ginger you are so talented. Wish I had the patience to quilt. Love the teachp one. I am not sure I know what stashing means. Hope you are signing all of the quilts you make with your name and date. No kidding you've been busy! Everything is simply gorgeous. The four seasons quilt will make a wonderful wall hanging. The teacher will really appreciate your quilt and treasure it dearly. I am so happy that you love your quilt. I loved it so much that I am in the process right now of making my daughter that quilt for her bed but in a full size quilt scale. Thanks for being understanding and recieving it late. Your new little quilt is adorable! And you've been a busy, busy girl. Can't wait to see the little dresses! what great quilts and such a nice gesture to make one for andrew's teacher. bentley's teacher has one more year left . . . maybe i should follow your example. how did you get all the signatures?